Poly Composite IBCs provide a cost-effective, reliable method of handling, storing and shipping liquids. Polyethylene composite IBCs are composed of an inner container extrusion blow molded from high-density polyethylene (HDPE), and an outer container made of a rigid welded galvanized tubular steel grid. The pallet can be plastic or metal. The fittings (valve, cap, gaskets ) will vary based on customer requirements. 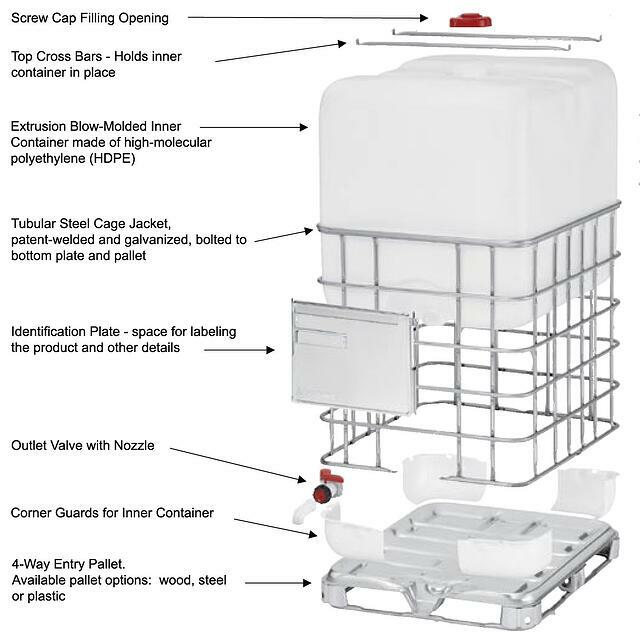 Poly composite IBCs are available in standard capacities of 275-gallons and 330-gallons. Durable and reusable, tote tanks save money on labor, storage and freight costs. Tote tanks provide an efficient alternative to 55-gallon drums. IBCs are easier to handle, safer to use and better for the environment. Sometimes referred to as "one way totes", poly composite tanks are ideal for those who want the size and space advantages of IBC's without worrying about cleaning, testing, and paying large upfront costs. Perfectly suited for high bay warehousing. Totes are able to be stacked four high when empty, and have a specially reinforced bottom plate that prevents deflection. The standard sizes for poly composite IBCs are the 275-gallon & 330-gallon capacities. The 275-gallon capacity provides the most cost efficient use of material and easily double stacks in common over-the-road trailers. 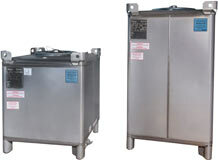 The standard poly composite tote tank dimensions are a 40" x 48" base, with 275-gallon containers having an overall height of 46", and 330-gallon containers having an overall height of 53". A 330-gallon poly composite IBC has the same base dimensions as a pallet, but can hold as much as six 55-gallon drums! Weight, w/ wood pallet 145 lbs. 165 lbs. Weight, w/ steel pallet 130 lbs. 150 lbs. Weight, w/ plastic pallet 139 lbs. 159 lbs. Our 275 & 330-gallon high density polyethylene tanks can be used to store a variety of industrial chemicals with a specific gravity of up to 1.9. 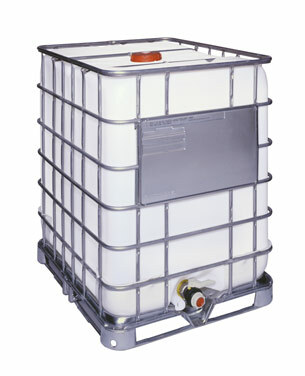 They are also commonly used in the food and beverage industry to store and transport liquids. Often referred to as “one-way totes”, poly composite IBCs are cheap enough that they are often used just a single time before being replaced, making them the perfect option for companies shipping sensitive products that need to be kept in a brand new container.